In July, the NIH released research suggesting teens are at greater risk for accidents in their first three months of getting a license as compared with getting their permit. The NIH also found that teens are far more likely to engage in risky behaviors that can lead to accidents when they have their license. On the sixth episode of Parenting Beyond the Headlines, my co-host, Sarah Cody, and I welcomed special guest, Tim Hollister, author of His Father Still: A Parenting Memoir and Not So Fast. 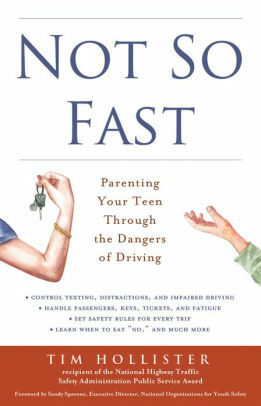 : Parenting Your Teen Through the Dangers of Driving. Since the death of his 17-year-old son Reid in a car crash in 2006, Tim has become a nationally known advocate for safer teen driving. He talks with us about how to keep our kids safe on the road. As the mother of a senior in high school in the midst of the college application process, I can say that there is definitely an added stress in the home. The stress is at times very exciting - looking forward to his new adventure. And it can also be very overwhelming. So how do you decide where to apply and where to go? And do the rankings play a role in your decision? According to a white paper published by Challenge Success, a research program at Stanford University, where you go means much less than how you engage in college. And, in the fifth episode of Parenting Beyond the Headlines, with my co-host, Sarah Cody, we look at the issue of college rankings. We welcome special guest, Denise Pope, Senior Lecturer in the School of Education at Stanford University, Co-Founder of Challenge Success, and author of Doing School and Miseducated Students. How much is too much screen time for kids under age 9? My children are very physically active but enjoy unwinding here and there with TV or iPad... posted by Amy Alamar on Vidoyen. Did you know that 1 in 13 American kids has a food allergy? Are you afraid of hosting kids with them? 54% of parents in a study admit to excluding kids from parties because they are afraid of the consequences of food allergies. In our fourth episode of Parenting Beyond the Headlines we talked with Gina Mennett Lee, Food Allergy Consultant. She shared some strategies for hosting kids with allergies and helping kids advocate for themselves.